A durable power of attorney is a legal document that plays an important role in your estate planning needs. It is a document that gives an agent authority to act on your behalf when you are no longer able to. In Arizona, powers of attorney do not have an automatic expiration date after five, ten, or twenty years. Unless you choose to put one in the document, they will last for the remainder of your life. Your agent only ceases to have signing power when you die. A durable financial power of attorney gives your agent, sometimes referred to as your “attorney in fact,” authority to handle your financial affairs. This can be as simple as paying your utility bill or taking money out of your bank account. However, it’s a good idea to make sure you select someone you trust and to speak with your estate planning lawyer to make sure the legal forms are set up with your best interests in mind. Often, financial power of attorney forms give the agent specific power to handle real estate transactions – meaning that your agent can sell your house. A durable health care power of attorney, also known as a medical power of attorney, allows your agent to make decisions regarding your end of life medical care, including the ability to grant or withhold consent for medical procedures and operations. The health care power of attorney also waives any HIPPA privacy rights you have to your medical information. After all, if someone is making a decision about a procedure, they need to be able to understand the procedure. If you have specific wishes about how you want your medical treatment to be managed, discuss them with your loved ones and ensure they are listed in your health care power of attorney. You should also work with your estate planning attorney to put together a living will, which is a document that will grant or withhold authority to “pull the plug” if you are in an unresponsive, vegetative state. Finally, Arizona also recognizes a durable mental health power of attorney. This document gives the specific authority to your agent, along with two doctors, to determine if you need psychiatric hospitalization. This is typically the case if you have a medication interaction that dramatically affects your mood and ability to function or if you have psychosis associated with Alzheimer’s or dementia. Signing this document while you are still legally competent will make it significantly easier for your loved ones to get you the treatment you might need later on in life. 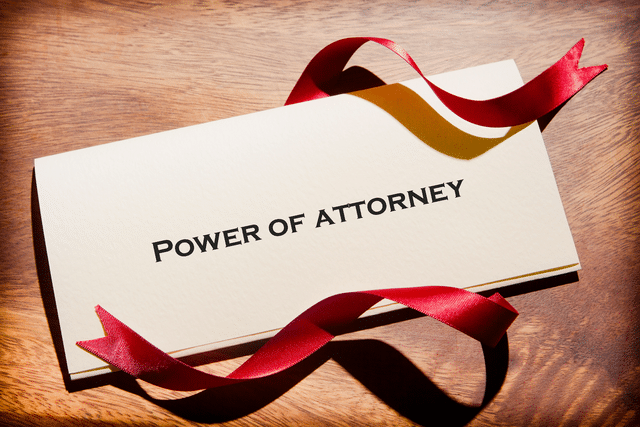 When Does a Power of Attorney Document Go into Effect? In Arizona, a power of attorney document can either go into effect immediately or it can be set up in a way that it only goes into effect when you become incapacitated. If you are older or have been diagnosed with a serious life threatening illness, your attorney may suggest that your power of attorney go into effect immediately. This gives your loved ones immediate authority to help you with your finances and to help you make medical decisions. Sometimes, this is out of immediate need. In other situations, it can be a lot easier to have your adult daughter handle your banking so you don’t have to make the trip to town. A power of attorney can also be drafted for a specific period of time. Perhaps your college student will be studying abroad in Australia for their junior year. Having them sign a power of attorney for the duration of their term abroad will allow you to manage their financial affairs while they are gone. They can set the expiration date as the day they return from abroad. In other situations, you may not want the power of attorney to go into effect while the ink is still wet. You want to be in full control of your finances and medical decisions until the day comes when you are no longer mentally sound. A power of attorney document can be drafted in such a way. This is sometimes known as a “springing power of attorney,” because it will spring into action at some point in the future. Estate planning isn’t just about deciding who gets grandma’s jewelry and who gets the family home. It’s also about planning for your end of life care, so that you can live comfortably for the remainder of your life. To schedule a consultation to discuss your power of attorney needs, contact us today.